Account Manager Elise Mannebach worked closely with Stephanie to recommend specific items and provide new ideas to fill in the College of Engineering’s promotional product assortment. From all presented items, ten promotional products were created to fit the College’s needs. The final products included coffee mugs, water bottles, phone chargers, phone wallets, mobile phone screen cleaners / grips, stickers, folders, padfolios, umbrellas, and fleece jackets. Part of the fast-growing tech category, the Juice Box Charger can charge smartphones, MP3 players and just about anything that recharges via USB. With the 2200 lithium battery, it can charge a device 1.5 times before having to re-charge the Juice Box using a wall charger (not included) or laptop. While Wisconsin chose red, its signature school color, the Juice Box is also available in Black, Blue, Aqua Blue, Gold, Pink, Purple and Silver. 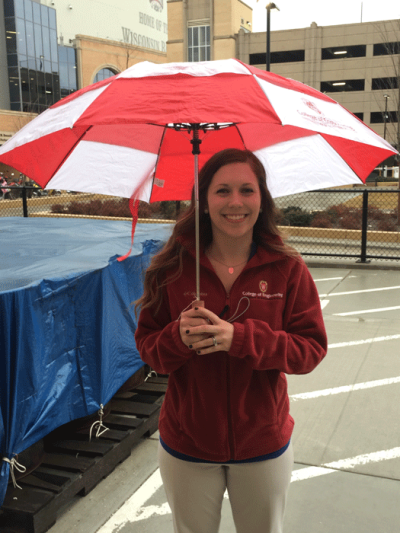 Red and white high-quality umbrella has a 43” arc with an auto open feature and solid wood handle. Vented technology allows the wind to pass through the vents. This simply means it’s easier to hold onto on extra windy days. Comes with a matching nylon sleeve and is available in 12 colors. Staff apparel gives a professional, uniform appearance to a department. When worn at events, it’s easy to identify employees – especially in a bold, red color! Instead of choosing a men’s option that women could also wear, Stephanie’s office opted to purchase both women’s and men’s fleece jackets. This is always a wise choice because the women’s version has better tailoring and fit, so they will not only look better, but also be worn again and again. The embroidered logo stands out nicely against the red fabric – made of 100% polyester 360g MTR fleece. Pill-resistant, lightweight fleece is comfortably warm and dries quickly. Jackets also feature elastic cuffs, open hem and zip-closed pockets. The College of Engineering now has an assortment of promotional items on hand for donor recognition, alumni relations, and events. With this supply, they can easily react to impromptu needs for a donor gift or upcoming event. By purchasing larger quantities up front, the College of Engineering benefitted from a lower price per piece on many of the selected items. Finally, the department achieved better organization and visual consistency across all promotional items, which is, in turn, strengthening the department’s brand identity.